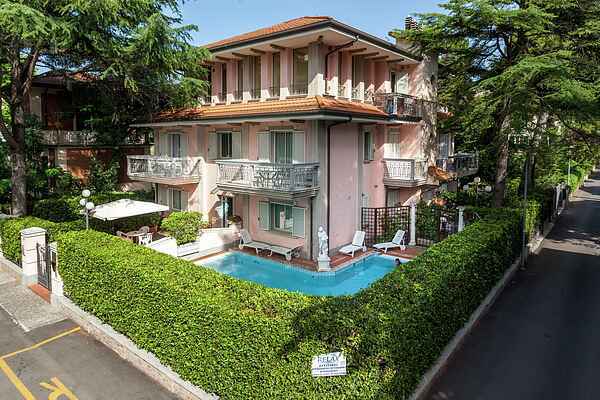 Restored 1900s villa in a central yet peaceful position, close by the promenade of Viale Dante and 500 mt. from the promenade of Viale Ceccarini. Beach at only 150 mt. The apartments are recently renewed, modern and comfortably furnished with satellite TV, air conditioning (from end June to end August), dish-washer, oven, safe, balcony or private courtyard. The residence has a pool with Jacuzzi (from June to mid-September) and some parking places at ca 150 mt (to be requested on booking). Small pets accepted on request (extra charge). We suggest this accommodation to families. Riccione is known as the 'Green Pearl' of the Adriatic for its beautiful parks and 19th century villas. In Riccione there is a lot to do, Viale Ceccarini in the centre is a long street full with exclusive boutiques, shops, bars and restaurants. Riccione is the place for an enjoyable and relaxing holiday where the friendliness and warmth of the people is part of their hospitality. Riccione is famous for the perfectly serviced beaches, the spa baths, the famous water park 'Aquafan' and last but not least, the nightlife in the well-known discotheques.